Last night, my wife and I were treated to dinner at the Salt Creek Grill (LINK) near Princeton, NJ. We had a very nice meal and wonderful conversation, part of which was about an issue with the wine list. The restaurant is known for having one of the better local wine lists, and they do. Lots of great choices from California, France, Italy, Argentina and other locales. There was also a seasonal supplemental list that included a listing for a 2008 Bruno Giacosa Falletto, Nebbiolo from Piedmont, Italy. Here is the (LINK), which I looked up after the bottle came. The wine was listed for $46.00. The 2008 Bruno Giacosa Falletto, Nebbiolo lists at $250.00+. Now, I am no expert in Barolos, but I have never seen one for under $80+ on a wine list. The waitress came and I ordered a bottle, figuring, what the hell? Not the wine or the winery listed on the wine list. 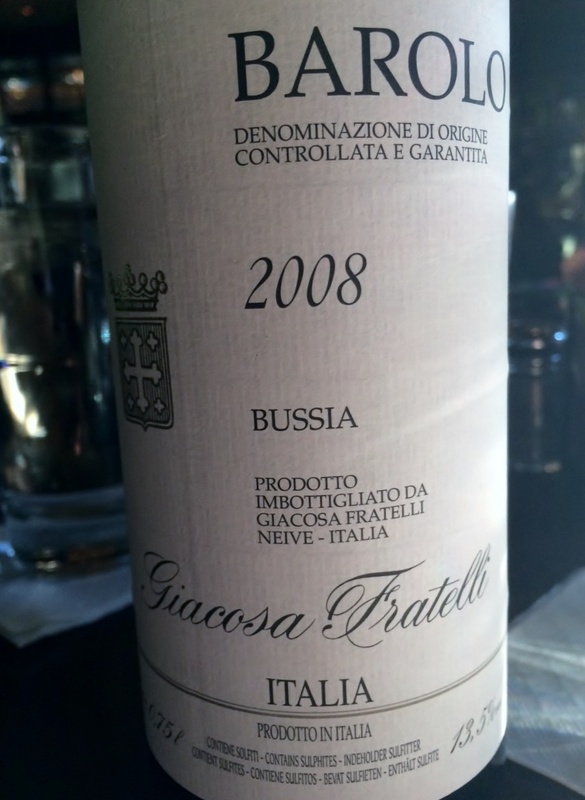 Instead, a 2008 Giacosa Fratelli Bussia Barolo (LINK), which retails at about $50.00. Still, we got a very good price on the wine. I told the waitress that the wine being served was not the wine listed on the wine list. She went and told a manager, who came over to the table after a few minutes. He told me that I was not getting “a Falletto” and I responded that I knew that. I told him that I thought he would want to know that the wine on the list was not what they were serving. He thanked me and asked if I would like a different wine. I said that this one would do. So pay attention to the wine served – I did not pick it up right away before it was opened. As it turned out, all was well and we did get a very good price on the wine served.